Importing data into ZipperAgent properly is one of the most important step to take full advantage of the CRM system. You want to ensure that your data is correctly inserted and that data formatting is maintained. Using the Import wizard, you can import data of different Record types into ZipperAgent. Import can be initiated from any page in ZipperAgent by clicking on the Import option from top right menu. The first part of the import process is to prepare your CSV file with all the necessary data. 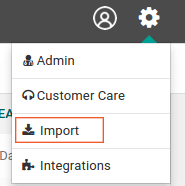 If your source application is not available in the “Source” list of values, then after selecting the Module, you can download the data import template by clicking on the download icon. Leave the default value for the “Source” field. Separate templates are used for different record types. The template for importing the Account information is different from the template for loading the Contacts. This template will give you an idea about the various data items that can be imported for the chosen record type and also help you in preparing your data. Prepare your data from your existing source. Please make sure that you create a .CSV file for your import data. The column headings for your source data may not match with the column headings of the downloaded template from ZipperAgent. ZipperAgent gives you the ability to map the column headings from your source data to the ZipperAgent column headings later on in the Import process. After you have prepared your data, use the Choose file button to select the CSV file from your computer. Post selection of the file, click the Upload button. In this step you make sure that data from your source application goes to the right field of ZipperAgent. Once source CSV file is uploaded, ZipperAgent will automatically try to map the columns in your source CSV file to the corresponding fields of ZipperAgent. Any unmapped fields (marked in different colour) can be mapped manually in this step. The fields under “CRM Field” are the ZipperAgent fields and the ones below “Import Field” are the ones that you need to use for mapping with your import data. Review and Import step will show the data which is ready to be imported and also the data which has possible error in two separate tabs. ZipperAgent displays the data that got successfully imported in this final step. It is recommended to start your import process with a few rows of data and after successful completion of the initial batch, you can import the rest of your data using the previously used CSV file format and mapping (ZipperAgent saves the previously imported mapping for you). In case you have got fields in your source application which cannot be mapped to any ZipperAgent fields, please create those fields in ZipperAgent by using Customization Module before you start importing.